The North-Eastern Hill University organised a programme to commemorate the ‘Surgical Strike Day’ on September 29, 2018 at 2 pm at the Multi-Use Convention Centre. 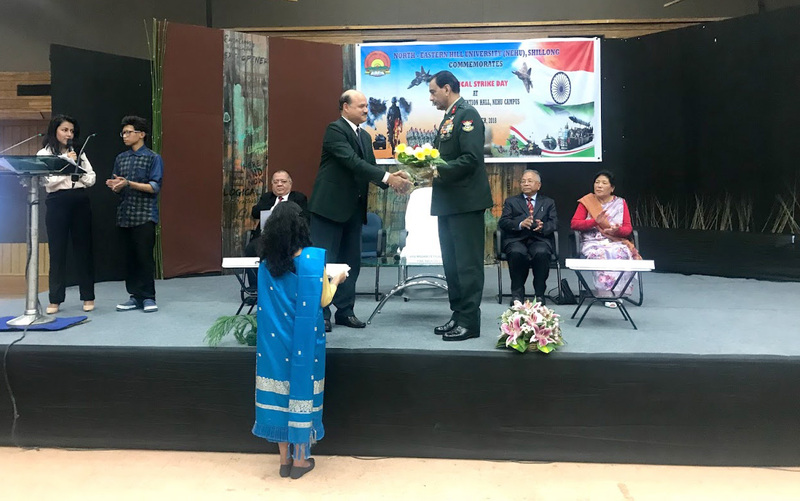 Brigadier William J.B. Sturgeon, YSM, SM (retd), Director Sainik Welfare & Secretary Rajya Sainik Board Meghalaya, Shillong was the chief guest on the occasion. The parents of (L) Clifford W. Nongrum were present as well. In his welcome address, Dr. J. Nayak, Registrar, NEHU said the programme is a tribute to the soldiers who pledge their lives at the frontier. Dr. Nayak also expressed his gratitude to the brigadier for gracing the programme at such short notice. He also welcomed the parents of (L) Clifford W. Nongrum, Mr. Keishing Peter and Mrs. Saily Nongrum and appreciated their presence to celebrate the Surgical Strike Day. Mr. Keishing Peter, in his speech recalled the early days of his martyred son and described him as an obedient, sincere, well-mannered and disciplined boy who never shied away from hard work. Mr. Peter spoke of his son’s training at the Siachen Glacier and the tough conditions which he took in his stride. Mr. Peter also spoke of his son’s bravery on his last day where in spite of his bullet wounds he continued to fight his enemy in hand to hand combat. “He promised us that he would make us the proudest parents in the whole world,” Mr. Peter said. In his speech, Brigadier Sturgeon gave a brief background of his life in the military and the various vigorous training he underwent to earn the medals adorning his uniform. The highly decorated veteran then went on to talk about the special forces and what it takes to make it to the elite force. He also gave a brief history of the special forces, the targets of the special forces, the training process, the IB (Intelligence Bureau), LOC (Line of Control) and the CFL (Cease Fire Line), special operations and how these operations are planned and executed, South East Region and China. Earlier, there was an audio video presentation on Surgical Strike followed by an interaction with the audience after the speeches. The programme concluded with the vote of thanks by Mr. L.M.K. Lyngrah, Finance Officer.